If you would like to support our work but are unable to visit the Sanctuary, a donation - however small - would be most welcome. You can use one of these following alternative methods. All donations are used directly in the running of the Sanctuary and the operation of the services we offer. 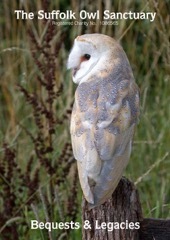 As a charity, the Suffolk Owl Sanctuary relies entirely on the loyal support of people like your good selves to help fund the upkeep of the Centre, to care for our resident birds and to continue the work we do to rehabilitate young or injured wild birds before returning them to their natural habitat. Through many and varied conservation & education projects, our key aim is to spread the word about the vital importance of preserving our native birds of prey & the ecological balance they help to maintain. Your help is always tremendously appreciated and every penny the Suffolk Owl Sanctuary receives makes a world of difference and a difference to our World! Leaving a gift to the Sanctuary in your will is a wonderful way to help ensure that the work of the Centre continues in years to come and your solicitor can easily advise you about how to do this, or how to attach a codicil to an existing will. Inheritance Tax is usually paid on an estate when somebody dies, if the estate is valued over the threshold of £325,000. Gifts to charities are deducted from the estate before the tax is calculated, which can mean paying less inheritance tax. Your estate is the total value of everything you own and will include any life insurance policies due to be paid out after your demise. Your net estate is the total value of everything you own after any specific gifts, costs for managing the estate and inheritance tax have been deducted. These are the people you want to leave a gift or sum of money to in your Will. Your executors are the people you have assigned in your Will to sort out your estate and to ensure that everything is done in accordance with your wishes. If you choose to leave someone a particular gift, such as jewellery or property in your Will, this is called a specific legacy. A fixed sum of money is called a pecuniary legacy. You may choose to leave someone a certain percentage or share of your net estate. The amount that person receives will then depend on what the total of your estate is after all taxes and expenses have been paid. Free and independent advice about making a Will is available from a number of organisations such as the Citizens Advice Bureau and Age Concern. You can also write your own will on a pre-printed form available from stationery shops or downloaded from the internet. It’s important if you are leaving money to a charity in your Will that you make it clear exactly which charity you want to receive your gift. There is an organisation called ‘Will Aid’ that will help you to make a Will and gives you access to professional advice from volunteering solicitors in return for a suggested donation to charity. We strongly recommend that you take the advice of a solicitor when writing your Will to ensure that the correct wording is used and your wishes are clear! By Phone: You can call us on 03456 807 897 - if we’re not here and you leave a message, it is treated in the utmost confidence. By Call-Back: If you would like us to telephone you, click here send us an e-mail with details of your name, phone number & day/time when it would be convenient to call.